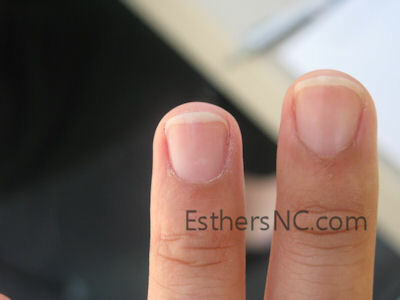 This is the second article in a series: CND Shellac application and removal. 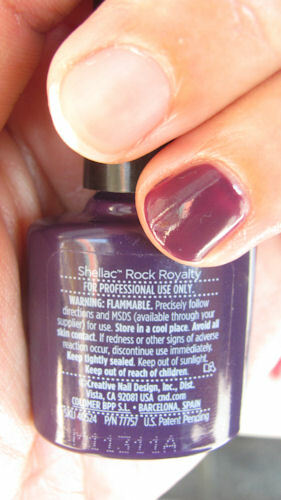 Read the first article about how to apply CND Shellac nail polish that you can do at home. The demonstration was done by CND Education Ambassador, Michele Huynh, who is also a nail technician at a salon at Del Mar, CA. Just want to show one of my nail sporting CND Shellac Rock Royalty before removal. This was 2 coats. 2. 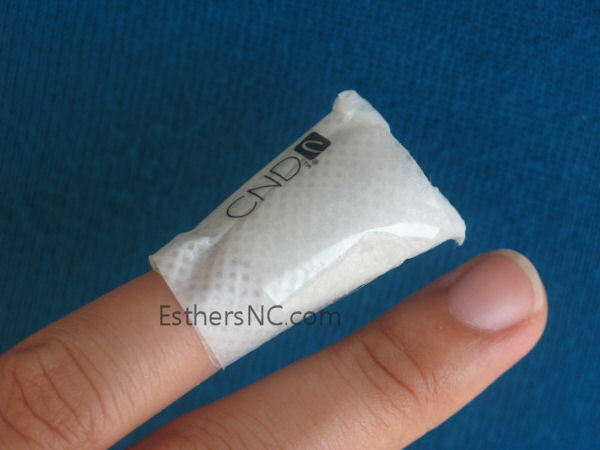 Wrap the nail with CND Shellac Remover Wraps. Make sure to saturate the cotton pad with Pure Acetone first. Then, place wrap under finger and fold the pad over nail and wrap around finger ensuring a tight, snug fit. Secure wrap with adhesive tab. The CND logo should be on top of the nail. Leave wrap for 10 minutes. 3. Using a twisting motion, slowly pull wrap from the nail. 5. Gently slide off any remaining polish with an orangewood stick. Be careful not to scrape away the surface layers of the natural nail plate. 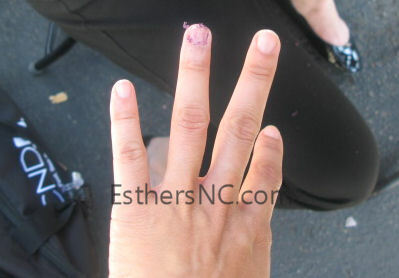 Don’t use metal pusher as it will scrape the layer of the nail. My nail is as clean as the others. Removal was a breeze with Shellac Remover Wraps. CND Shellac removal is best done with Shellac remover wraps. She strongly discouraged soaking nails with Acetone because it will make the nail and cuticle dry. Thus it will create problem of weak and splitting nails in the future. If you are wondering what color she used, it was Moonlight & Roses over Asphalt. Here is her nails. Using a pump bottle like this will minimize messy application. Sounds easy to do? It sure is. Removing shellac nail polish is supposed to be easy. No filing, no damage to the nail bed. 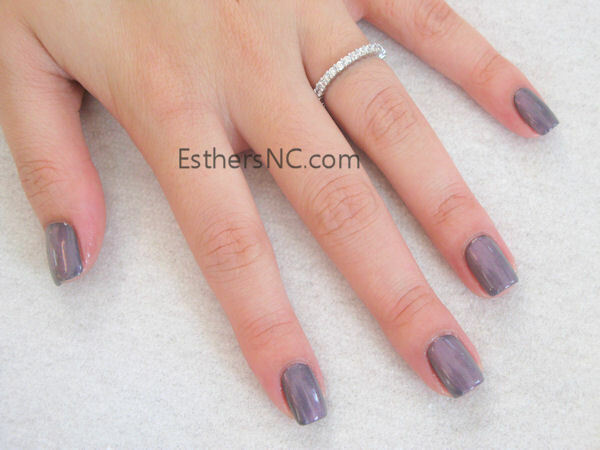 All CND Shellac polish, wraps and pure acetone are available at Esther’s Nail Center. 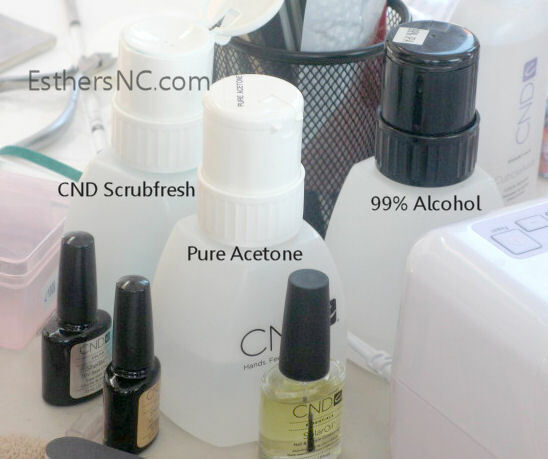 Visit us for CND Shellac products, Gelish, Daisy Gel and other manicure pedicure supplies.